National Pet Month in its 30th year, and this year it falls between 1 April and 6 May. It's a period to appreciate our pets a little more than usual, so why not celebrate our animal friends by spreading the word on responsible pet ownership, raising money for your favourite UK pet charity, or even taking your pooch or kitty on a short pet-friendly break in the UK! Tons of places welcome pets these days – read on for some of our favourite UK dog-friendly hotels and B&Bs; for complete collections read our dog-friendly B&Bs, cottages and hotels guides. This is a proper village pub with comfy rooms, delicious food and 3 dog-friendly rooms: beloved pooches will receive a welcome box containing treats, a blanket, a water bowl, poo bags and a towel for muddy paws – and the owners are more than happy to share their favourite walks near their pretty South Oxfordshire village. Arriving here is a bit like attending an old-fashioned country house party – Tom the efficient butler and Honey the dog are here to greet you, and there’s the chance to take the weight off your feet in the book-lined lounge, where a fire burns in the grate, and you’re tempted to either tinkle at the grand piano or more likely help yourself to a drink from the well-stocked honesty bar. What's more dogs are welcome; indeed it’s the sort of place that can’t help but be enhanced by the presence of a well-behaved pooch or two. 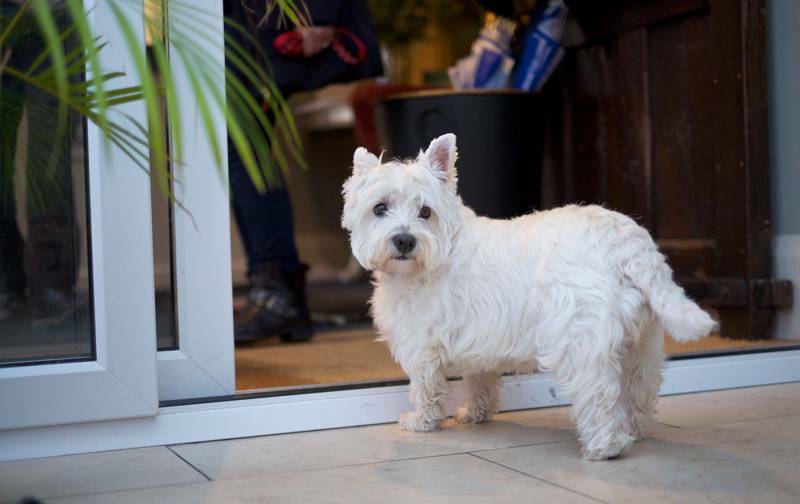 Canine companions are welcome to stay in all Rick Stein accommodation in Padstow, Cornwall. Bring your dog on a coastal escape for £30 for the first night and £5 for any additional nights. Don't worry, your furry friend will be treated as a VIP, gifted with a complimentary blanket, toy, water bowl, Green & Wilds organic treats and a jute bag on arrival. Guests can even book a dog-sitter while they dine at one of the fab restaurants. This Shropshire hotel enjoys a great location at the top of the small town of Bishop's Castle and is also one of the most dog-friendly hotels we know – not only encouraging you to bring your pet but also providing a 'Dog Welcome Box' in the room that includes a feeding mat, food bowl, towel, lead, treats and even poo bags. Plus your hound might like to play with the owners' friendly dachshund Millie. Lots of places advertise rooms with sea views, but very few offer one from every room: our friends at the Atlantic do just that, including 4 bedrooms that allow doggies, include a comfy dog basket and treats on arrival. A perfect seaside escape with easy access to some of the best beaches in the country. Graig Wen offers great glamping and also has a beautifully located B&B and self-catering cottages, so there really is something for everyone – including your pup. So whatever you're looking for, why not book a few days at this high-quality, dog-friendly holiday accommodation? It's the ideal base for exploring Snowdonia. This quirky and luxurious Cornwall hotel not only enjoys a fabulous location by the sea, it's super dog-friendly too. They've recently refreshed their doggie welcome hamper to include everything your faithful friend could possibly need – locally baked treats, bowls, fleecy blankets and a microfibre towel. Try their Wallace & Gromit break, which is available all year round – prices from £220 per room per night. Suffolk's Crossways may not allow cats and dogs (free-range livestock and wildlife put paid to that), but it does allow small indoor pets. Bring your guinea pig, rabbit or hamster and they can board for the night in the 'animal zone' whilst you bunker down in the exclusive-use B&B wing. Pets and adults will both enjoy five-star treatment. This glorious one-of-a-kind Lake District B&B is not only properly dog-friendly, it's also about as comfortable a the designer bolt-hole as you could find, with three spacious and suites and the self-contained Juniper House providing spacious accommodation and huge bathrooms. They bring breakfast to your door so you don’t even have to move, and transfers are offered down to their excellent Grasmere restaurant, the Jumble Room. An exceptional boutique B&B in the heart of the Yorkshire Dales, dogs are welcome in most rooms, and on fine days can join the owners’ pets in the extensive gardens. Stow House occupies an artfully renovated Victorian vicarage, and guests can enjoy magnificent vistas from every room. The excellent breakfast is freshly cooked to order, and they can also make packed lunches or an evening meal for larger groups.